From left: Judy Cooperberg, Col. Angela W. Suplisson, vice commander of the Air Force Test Center at Edwards Air Force Base, Calif., and Rep. Steve Knight, R-Calif., at the Nov. 4 Veterans Military Ball hosted at the University of the Antelope Valley. 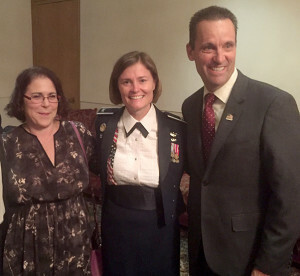 LANCASTER, Calif.–Speaking to an audience of about 300 veterans and family, plus military supporters and active service military, Col. Angela W. Suplisson shared a few thoughts on her concept of what constitutes a hero. Suplisson is vice commander of the Air Force Test Center, headquartered at Edwards Air Force Base, Calif. She reports to the Test Center’s commanding two-star general, Maj. Gen. David A. Harris, and provides key executive direction in running a $31 billion enterprise of more than 18,000 military, civilian and contractor personnel, according to an official Air Force biography. Test Center personnel are based at Edwards, and also at Eglin Air Force Base, Fla., and Arnold Air Force Base, Tenn. Recently, Suplisson talked about heroes at the Veterans Military Ball hosted at the University of the Antelope Valley. She sat at a table of honor with Rep. Steve Knight, R-Calif., who sits on the House Armed Services Committee and was an Army veteran of the Cold War. She had forefathers in World War I, World War II, and her father was a squadron commander in the Air Force, and she followed in that family tradition. Those family members became the role models she chose to emulate, and she doesn’t even resent a brother who took a commission in the U.S. Navy, she joked. Audience members included veterans of World War II, well into their 90s, and also Korean War and Vietnam War veterans. There were also veterans of the wars fought since Operation Desert Storm, and after the terror attacks of 9/11. Among those she cited as authentic heroes of community included local businessman Jin Hur, who hosts the weekly Coffee4Vets coffee klatsch and information forum at Crazy Otto’s Restaurant on Avenue I. The Coffee4Vets breakfast table meeting happens on Tuesday mornings at the Crazy Otto’s on Avenue I. Another morning group, the Antelope Valley Veterans Community Action Coalition meets on Wednesday mornings at Birdies restaurant on 10th Street West in Palmdale. Suplisson went on to identify other groups that met her idea of providing a hero model for people who want to support veterans of the armed forces. She just said “Wow!” about the work done by the committee that organized the Veterans Military Ball, overseen by Vietnam War Era Army veteran Debbie Herron, joined by Juan and Atherine Blanco of Coffee4Vets. Vets4Veterans formed nearly a decade ago, and emerged from a talking therapy group for veterans coping with Post Traumatic Stress Disorder. The group recently hosted its 8th annual Vets4Veterans Car Show, followed soon after by the group’s annual golf tournament. Proceeds from the events go to scholarships for veterans recently released from service, in transition, taking classes at Antelope Valley College. Vets4Veterans also helps with short-term emergency grants for veterans, such as immediate grocery needs, or short-term emergency hotel stays. “These are heroes,” Suplisson said. Another group the colonel lauded is the Point Man of the Antelope Valley talk group that meets weekly on Tuesday evenings. The group works closely with the AV Wall Committee, the group that organizes presentations of the Antelope Valley’s Mobile Vietnam War Memorial. The AV Wall, as it is known, is a half-scale tribute to the Vietnam War Memorial on the Mall in Washington, D.C. It concluded an annual display at the Palmdale Amphitheater at the close of the Veterans Day weekend observations. She also lauded the Veterans Alliance that meets quarterly at Mental Health America of the Antelope Valley, and the work done by MHA leader Judy Cooperberg in standing up a Military Resource Center that provides housing support for veterans and families at risk of homelessness. “These are groups that put back into the community, and they are heroes,” Suplisson said. The commander joined with Cold War veteran Danny Bazzell in providing honoring remarks at the Veterans Ball. Bazzell, general manager of the Flight Test Historical Foundation, spoke on the service and jeopardy faced by all who served during the long Cold War standoff with the world’s other superpower of that period, the Soviet Union. Supplison was commissioned in 1991, just as the Cold War was ending, and just in time for all the challenges to national security that Americans have faced since then. Her work at the test center involves developmental test and evaluation of experimental and research manned and unmanned air, space and cyber systems for military services, DARPA, NASA and international partners, in addition to operation of the U.S. Air Force Test Pilot School. After graduating from Test Pilot School, Suplisson stayed at Edwards and was assigned to the 416th Flight Test Squadron where she performed weapons and avionics flight testing on U.S. and foreign military sales F-16s. She then moved to the 410th Flight Test Squadron at Air Force Plant 42, Palmdale, Calif., where she served as a flight test engineer and flight commander for F-117 low observable and weapons testing. In 2000, she was selected to study in France for the Olmsted Scholarship. She was a Distinguished Graduate in the French Basic Course at the Defense Language Institute in Monterey, Calif., in 2001, and was assigned to study in Lyon, France. She graduated with a master’s degree in International Policy and Strategy from the University of Lyon III, France, in 2003. While assigned to the Joint Strike Fighter Program Office from 2003 to 2006, Suplisson was both the executive officer to the program executive officer and an International Program Manager for Canada, Italy and Turkey. From 2006 to 2007 she was the F-16 Program Element Monitor in the Directorate of Global Power, responsible for the budget of the F-16 in SAF/AQ at the Pentagon. From 2007 to 2009, she served as Commander, 846th Test Squadron, 46th Test Group, 46th Test Wing, Holloman Air Force Base, N.M., where she led 120 people at the Holloman High Speed Test Track in the design, fabrication and testing of sub-, super- and hypersonic rocket sled-borne systems. From 2009 to 2011, she was the Deputy for Plans and Programs, the Deputy Department Head, and an Instructor of Aeronautics in the Department of Aeronautics, US Air Force Academy. She earned her doctorate in Aeronautical Engineering with research in optimal aircraft trajectories for automatic ground collision avoidance systems in 2015 at the Air Force Institute of Technology. 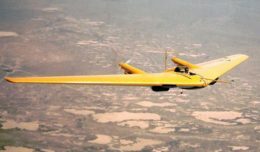 Colonel Suplisson led the Department of Aeronautics at the U.S. Air Force Academy from 2015-2016, and led the Unmanned Aerial Systems Center from 2015-2017, responsible for all UAS research and UAS airmanship training at the US Air Force Academy. Editor’s note: This story includes material from Suplisson’s official Air Force biography.